In the Dec, 2007 issue of 正論 Monthly, a Mr 鶴田利忠Zuruda Toshitada of 福井Fukui Prefecture asks if any one has more information on the air raid on Feb 23, 1938, conducted by the Chinese Air Force. It had hit Taipei and Hsin-chu resulting in a casualty of 37. The bombers were the Tupolev SB2s manned by Russian pilots. When they reached the targets, the engines were switched off, and the planes glided in stealthily to drop the bombs. Many residents had seen the bombers flying in. This (left) is the Tupolev SB2 bomber powered by two M100 12-cylinder water-cooled engines with a crew of three. In the fall of 1937, the Nationalist Chinese Air Force received 62 SB2 M100s from Soviet Union. And the attack on Taiwan on Feb 23, 1938, was carried out by the Soviet Volunteer Group based in 漢口Hankow, more than 1,000km from Taiwan. Twenty eight (28) SB2s were deployed, accompanied by 12 others from the 南昌Nanchang Bomber Group. 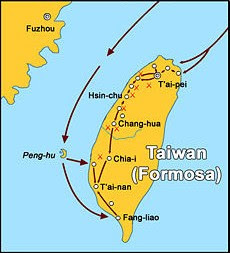 The formation flew over Foochow, across Taiwan Straits to the north of Taiwan, then turned south to reach the targeted airfield in Taipei. The Japanese air-defense might have assumed that planes from the north would have been from Japan and therefore did not sound any alarms. There was in fact no resistance of any kind until almost the end of the raid. Presumably, a total of 280 bombs were dropped, the first ones from 10,000 ft. Some 40 [or 12 according to another source] Japanese warplanes were destroyed on the ground. The hangars and fuel depots (with 3 years' worth of supply) had also burned. The victory dinner in honor of the Soviet volunteers was hosted by Madam Chiang Kai-Sek herself. The surprise attack must have embarrassed the Japanese Colonial Gov't, so the populace was told that the SB2s had cut their engines and flown in silently. It is also unclear if Hsin-chu was ever bombed. On the other hand, the claim of 280 bombs unleashed by the SB2s seems an exaggeration as well [Note: This number might have come from the 10 small bombs, consisting of 6x154- and 4x33-pounders, carried by each SB2, and 10 x 28 bombers = 280]. We thank Mr Koh for providing the article shown above and Mr Patrick Cowsill for bringing this matter up (for more, see his comments in the previous post). Here are two short silent footages documenting the involvement of Taiwan in the Pacific War, both dated 1945. How did the Taiwanese get invited/dragged into the war - officially? Compulsory military service in Japan actually started during the Meiji Era, in 1873. This was the beginning of a modern army. The conscription was, however, selective - in part to preserve the old feudal samurai tradition. And there were loopholes, for example, the only son (could be an adopted one) of a widower was exempt and the rich could pay to get out of the service. By early 1900s, the draft became universal, all Japanese nationals between 17-40 years of age must serve. Depending on the fitness, the conscripts were separated into three groups: active duty 1st class, the reserves (both 1st and 2nd classes), and the territorial reserves. 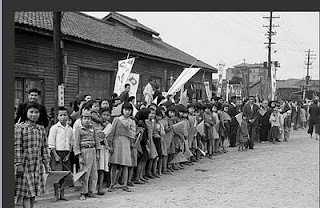 It should be noted, however, that the military training of the Japanese in fact started early, from the third grade on, all the way through junior and senior high schools. In a way, entering the military service was merely an extension. During the colonial rule, the Taiwanese (and the Koreans as well) not being Japanese nationals, were in fact not legally eligible to serve. When the Sino-Japanese war broke out in 1937, some Taiwanese were hired to perform supporting noncombat duties. With the mounting losses in the South Pacific after Pearl Harbor, the Japanese military had to open other sources of manpower. To get around the legality issue, a Special Volunteer Army System (陸軍特別志願兵制度) was enacted in Taiwan in 1942, followed by a similar one for the Navy (海軍志願兵制度) a year later. A whole generation of Taiwanese, having grown up and educated under the Japanese rule, signed up in great numbers to take the qualifying exam. The immediate reward was that a Taiwanese soldier of the Imperial Army would become a true Japanese citizen. A good analogy is the current US volunteer army, a foreigner-enlistee can become an American citizen almost overnight to enjoy the full rights. However, near the end of the war, young men were more reluctant to join up and were often "persuaded" by their superiors or worse, the local police to enlist. By 1945, all were drafted into the military anyway - to prepare for an all-out invasion by the US military. The US attacked Okinawa instead thus sparing Taiwan huge losses of lives. The first film above is a rare glimpse of the not too distant past; the volunteers/draftees were all sent to SE Asia to fight. And of the 207,083 who went, 30,304 did not come home. On Oct 12, 1944, the American Navy bombed Taiwan; this was to continue until the end of the war. On that day, the carrier-based F6F Hellcats dropped bombs all over the Island that included Danshui and Hua-lien (see previous posts by Eyedoc and ChoSan, respectively). On Aug 15, 1945, Japanese Emperor Hirohito announced, through radio broadcast, Japan's unconditional surrender - in a classical language incomprehensible to the common folks. Rumor has it that, after the war, the US paid compensations to losses owing to the bombing raids. It was probably just that, a rumor. At least no one in Danshui was ever compensated. 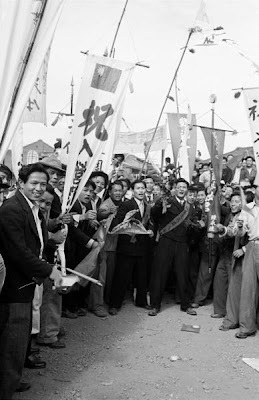 A 1950 photo taken by Carl Mydans (1907-2004; Life Magazine photographer) shows two draftees from Taipei, identified by sashes across the chest, being sent off by friends (below center). The banners are still in the Japanese style, a carry-over from 1942-45 (for comparison, a similar Japanese banner is shown on the lower left, click to enlarge). In Danshui, the draftees were loaded onto decorated flat-bed trucks and paraded on Chung Cheng Road with school children cheering on from the sidewalks waving small triangular paper flags (not unlike the scene shown below). The men then traveled all the way south by the slow train to the training camps in 鳳山Feng-shan. Least we forget: In a cruel turn of events, some of those who returned to Taiwan from SE Asia in 1946 were shipped at gunpoint to Mainland China to fight the civil war there. 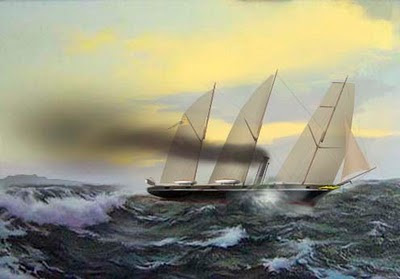 Yes, this could be the magnificent 萬年清 in action with the sails and the steam engines all operating at the same time. 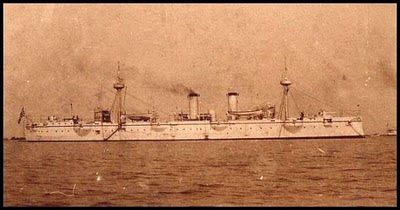 During the Battle of Fisherman's Wharf, 萬年清 was stranded together with the British gunboat, the Cockshafer, inside Danshui Harbor. This was not just some ordinary ship, it was the first western-style ship ever built by the Chinese, in the shipyard of 福州船政局Foochow Naval Affairs Bureau - with the help of French engineers. 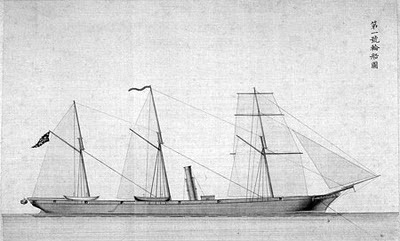 The sketch below shows the No 1 Steamer (i.e., the 萬年清, erroneously reported as the No 13 Transport by John Dodd in his journal), essentially a 2X scaled-up version of the original design of French gunboat, La Motte-Picquet (depicted above). 萬年清 was a wooden ship built from timbers imported from Thailand and Taiwan, and the hardware from France. The construction was started on Jan 18, 1868 and finished on June 10, 1869, costing a total of 163,000 silver taels. 萬年清 of course was the pride of China. 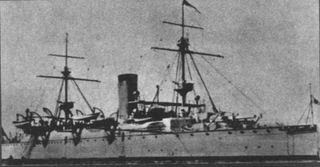 It entered the naval service as a gunboat but later in 1881 was modified into a transport ship - by adding a 10-room passenger cabin on the upper deck and renovating the crew's quarters into a cargo bay. In the Sino-French war, the ship was docked in Danshui thereby avoiding destruction by the French Far East fleet in the Battle of Foochow across the Taiwan Straits. It, however, was damaged by typhoon in Danshui in late 1885 and had to return to its home port Foochow for repair. It sailed off Foochow for the last time in March, 1886. The 萬年清 cruised between Danshui and Amoy on a regular basis. It was small and sleek, the designated express courier of government messages and more. Danshui's role as an international shipping port started in 咸豐元年 (1851). The port was officially opened in 1860 together with the creation of Danshui Customs Office. From 1862 to 1894, Danshui was the most important commercial seaport in Taiwan. Not only for import-export of commodities but also passengers traveling to and from Amoy, Shanghai and Hong Kong. The shipping lanes between Danshui and several seaports in China (e.g., Foochow and Amoy) remained open until 1909, 6 years after Keelung finally overtook Danshui in trade volume. For various reasons, the most crucial one being the sandy deposit issue, the Japanese Colonial Gov't had elected to further develop the port of Keelung at the expense of Danshui. And the sailing of the flat-bottomed junks into Danshui Harbor ceased totally in 1937 owing to the Sino-Japanese war. Danshui has become a seaport in name only ever since. The 萬年清? Ah, yes, a British ship, the Nepal, collided with 萬年清 in the early morning fog of Jan 19, 1887, while the latter was anchored outside of Shanghai waiting to enter the Huang-Pu River. It was carrying the military payrolls and the official documents both of which intended for Liu Ming Ch'uan in Taiwan. This brought an end to the 18 years of 萬年清 service at sea with the loss of 114 lives. After a court ruling, the Great Britain Shipping Co, owner of the Nepal, eventually paid the compensation. This is a wood-block print entitled "Missy Liu's great victory over the Wuo-noo". The date of its publication is unknown. It appears to be part of an illustrated folklore recounting a battle against the Japanese takeover of Taiwan. 倭奴 (Wuo-noo), in the title, is a derogatory term with a connotation just a tad worse than "the Japs" used by the Americans during WW2. A loose translation of the text: "That the subordinates must die to avenge the insolent insults to the emperor is the rule since time immemorial. General Liu [i.e., 劉永福Liu Yung-Fu] has defended Tainan successfully achieving many victories. Then there is Missy Liu, who hates the guts of the Wuo-noo, has formed an army of female soldiers to attack the Wuo-noo in Taipei. The latter are just a disorganized mob, no match for the women warriors. They are defeated crying out in great sorrow, and the wailing reaches the heaven." Both triangular banners are the much-famed Black-flags of Liu Yung-Fu. In the picture, the Japanese are being slaughtered, as they are running away in horror, by Missy Liu and her lance-wielding Amazons (with bound feet, no less). It is unknown if there were really Commanders Liu and Sai; although the victory in Taipei never did happen. And the deployment of combatant women soldiers, even though true in Chinese history, but probably not so in this case. Does this mean that the defense of Taiwan was based on fantasies? Not at all. The battles were fought with great bravery at huge losses that strongly indicated an over-matched firepower. The equipment of the regular army dated back to the Sino-French War, and the militia often were armed only with cold weapons. These were all perfectly understood by the Taiwanese and yet they still chose to fight on. There was no re-supply or reinforcement from China; no navy to protect the shoreline or to engage the IJN fleet at sea. The odds were stacked against the Taiwanese. Even so, the loss of the Japanese was so high that the casualty stats must be white-washed with reports of deaths owing to illnesses - in order to retain both the public and the governmental supports. In the First Sino-Japanese war (1894-5), the Japanese army and navy had coordinated their attacks on land and from the sea when advancing through the Korean Peninsula. The same was applied in the conquest of Taiwan. The IJN fleet, fresh from the victories in the Yellow Sea and Port Arthur, quickly escorted the first Japanese force, the Imperial Guards (of about 7,000 men), to land near Keelung (upper right) on May 29, 1895. A peaceful takeover it wasn't, the red crosses on the island (on the map above) indicate major skirmishes where the Taiwanese fought back. The Imperial Guards, having already been engaged in quite a number of deadly encounters with the Taiwanese militias since the occupation of Taipei in June, fought their way south. On Aug 8, they defeated the local defenders in 新竹Hsin-Chu followed by another fierce battle in 彰化Changhua on Aug 27, and yet another in Chia-I on Oct 9. 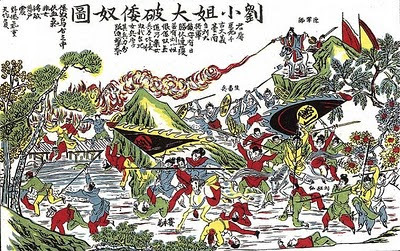 The Japanese strategy was for the remaining Guardsmen and the two reinforcement units to mount attacks from both north and south to ultimately capture Tainan, the last stronghold still in the hands of Liu Yung-Fu's army. 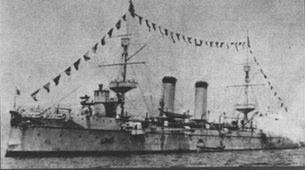 In addition, five Japanese warships arrived in the outskirts of the Port of Takow on Oct 12, 1895. At 7AM on Oct 13 (another source puts it at the 16th), three of them, 秋津洲Akitsushima, 浪速Naniwa, and the flagship 吉野Yoshino opened fire and bombarded the port which quickly fell. In fact, the mere sight of these steely warships was at once demoralizing to the defenders. The British had evacuated their citizens to a battleship expecting a prolonged battle which, however, never materialized. Everyone went home in the afternoon. Once Chia-I fell and Takow lost, Liu Yung-Fu had no choice but to sue for a conditional surrender: clemency for the Taiwanese fighters and repatriation of his 黑旗軍black-flag army to Amoy or Canton. The Japanese, however, demanded an unconditional one. With no other recourses, Liu abandoned his army, fled on board a British ship (the SS Thales) in disguise, and headed for Amoy on Oct 20. The City of Tainan yielded on Oct 21, 1895. On Oct 22, about 8,000 of the still well-armed and once proud 黑旗軍, who had defeated the French many times in the Sino-French war in Tonkin, surrendered to the Japanese. One day later, only some 5,100 were repatriated. As in the case of the repatriation of Qing soldiers in Danshui, there was a discrepancy in the number of soldiers before and after the process. And how many actually safely arrived back in Amoy was also unknown.